Why Do ROSS Poppet Valves Pop? ROSS poppet valves pop open and closed almost instantly. Surface areas of the piston poppet, the exhaust poppet and the inlet poppet are carefully calculated to produce strong shifting and sealing forces in each direction. This results in a design which ensures high speed, repeatability and high shifting forces. The following illustrations show the forces acting on the valve in both actuated and deactuated states. The forces shown are for a Series 27 valve with 1/2″ to 1″ ports. Other valves have similarly proportioned forces. The only friction to be overcome in the movement of the valve is the U-cup seal on the piston poppet, and the spindle in its guide at the bottom of the valve. The frictional forces at both these points are insignificant in relation to the forces acting on the valve. 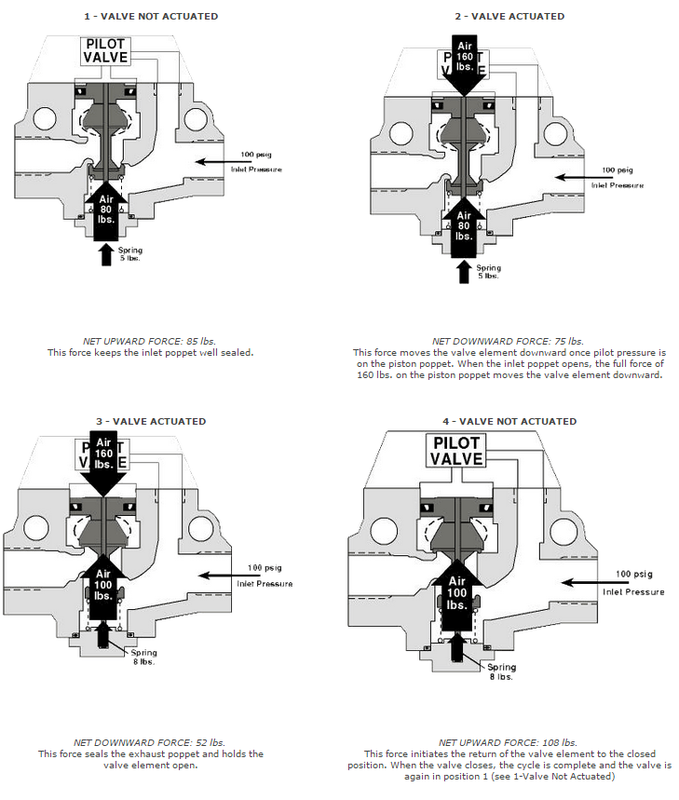 ← Why So Much Concern Over Valves?